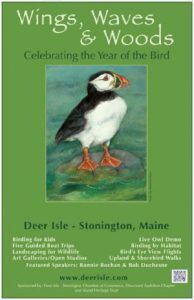 This annual birding and art festival comes to the island towns of Stonington and Deer Isle on May 18 & 19 with nearly two dozen events to choose from. Pack your weekend full of events or just pick one or two and then go exploring on your own! As part of this annual celebration, Rabbit Hill opens up for lunch on Saturday and Sunday, May 18 & 19, from 11:30 – 1:30 PM. Chef Cheryl will be busy in the kitchen whipping up piping hot popovers, Crockett Cove Clam Chowder, Root Vegetable Chowder, and Rabbit Hill Rhubarb Crisp. Our hot popovers are served with a selection of our delicious jams Wild Blueberry, Strawberry Rhubarb, Apple Maple Butter, Spiced Peach Butter and Barbour Farm organic cider. The weekend’s full schedule is available at islandheritagetrust.org and accommodations can be found at www.deerisle.com.